Ginger Garlic Teriyaki Mushrooms Skewers. Bold ginger, garlic and teriyaki based marinade. Salty marinades work to penetrate flavor more deeply into food. Perfect vegetarian and vegan barbecue recipe. Maybe I’d prefer not to cope with the fact the summer is making it’s gradual transition into the fall. It’s like a good friend you know is moving and you’re trying to get as much quality time in as possible before the inevitable. With all things that transition to another period, you often try to cherish the current times. 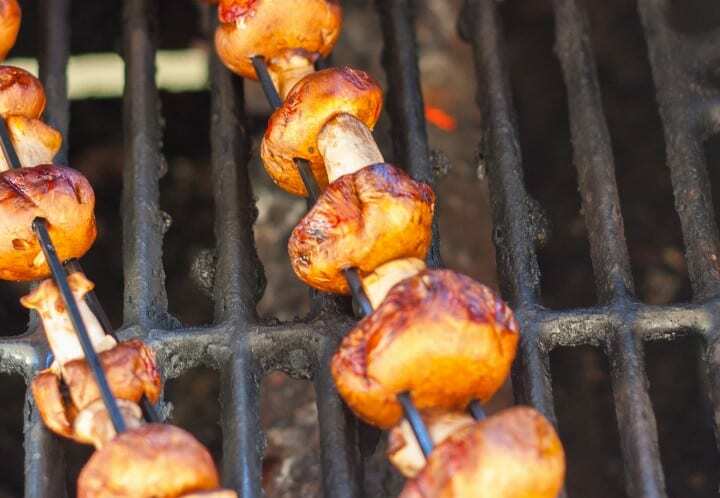 I’ve been barbecuing often, and recently created these Ginger Garlic Teriyaki Mushrooms Skewers. The name is pretty self explanatory, but what’s the fun in leaving it at that. I’ll do what any passionate food blogger does and elaborate on the sensory specifics of the recipe. Mushrooms have an umami flavor palate, which is also known as meaty. This is why you often see mushroom burgers as a vegetarian option; you can enjoy the flavors without the guilt of breaking your lifestyle choice. Mushrooms are a flavorful, healthy choice as a side as well. This recipe features a bold ginger, garlic and teriyaki based marinade. Salty marinades work best in that the flavor penetrates more deeply into the food. Ever wonder why most marinades include soy sauce, teriyaki sauce, added salt, or other salt-based ingredients? 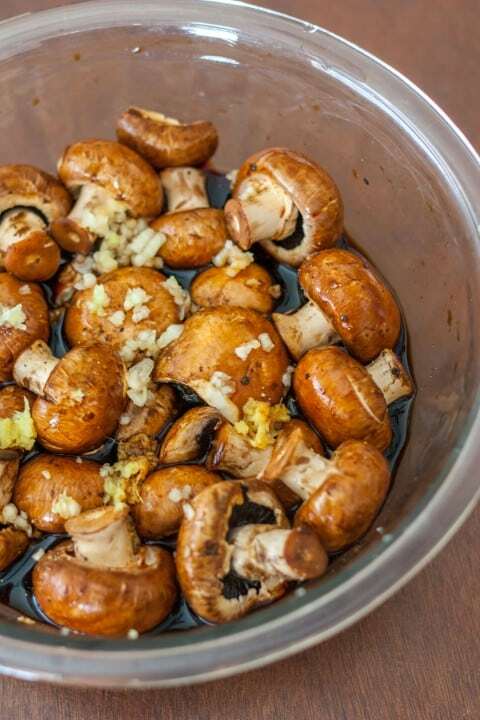 The light, porous structure of mushroom takes exceptionally well to marinades and soak up the flavor. I wanted to show each aspect of the recipe phase; from marinating, grilling and final presentation. I recommend showing the marinate in your photography if the ingredients are not as clear in the final cooked recipe. In my image you can clearly see the ginger, garlic and teriyaki sauce. These would otherwise be unrecognizable when cooked. Bold ginger, garlic and teriyaki based marinade. Salty marinades work best in that the flavor penetrates more deeply into the food. Add all ingredients into a large bowl. Gently mix to combine ingredients and coat mushrooms in marinade. Marinade for 30 to 60 minutes, stirring occasionally. 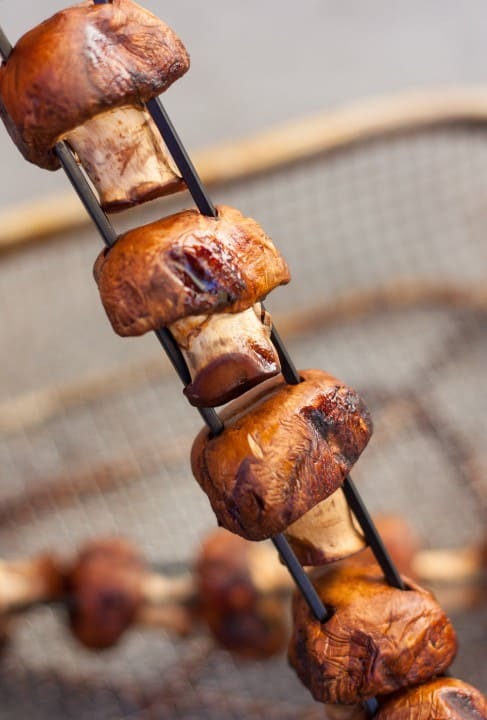 Place whole mushrooms on skewers, touching each other. Heat barbecue to medium heat. Place skewers on grill and cook for 7-10 minutes, rotating every few minutes, until cooked and grill marks appear. Using 2 skewers is such an awesome tip! 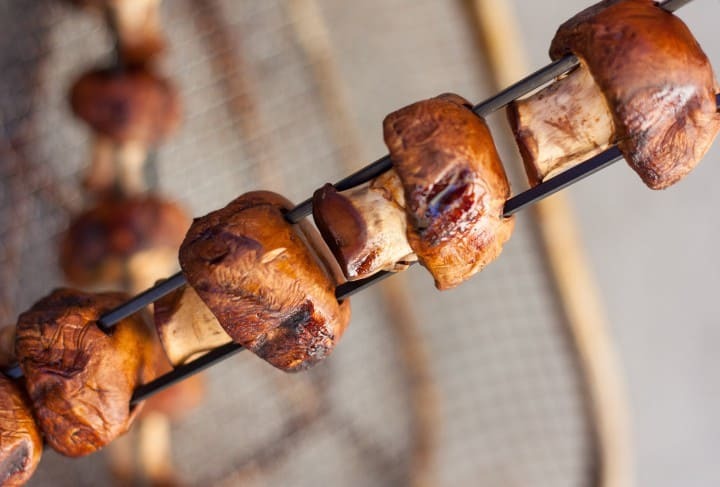 Grilling these mushrooms are a BRILLIANT idea! Thanks Shashi. 2 skewers definitely makes grilling skewers more manageable. I like grilling all kinds of veggies. A grill basket also works great to keep them from falling through.